Been meaning to put together a highlight reel of our season last year. Took me a while. There’s something about the turn in the weather that makes me begin to feel like it won’t be too long before we can start another cycle. The one major distraction from thinking about next bird season is the current, horrendous tick season (see my post from last year about ticks); after a run last weekend I pulled 32 ticks off of poor Angus. But I digress. We got out a lot last season and, thanks to my wife whose video skills have gotten quite good and who has no interest in shooting birds with a gun (lucky me! ), we got some good pictures. Although I have a favorite spot I go to whenever I have the time, we made it to a bunch of different places and saw some incredible country. Angus, with very little training, is more than I could ask for in a hunting partner. I’m lazy on the work and don’t have the patience to make him steady to wing. We see plenty of birds and my shooting – which I hope to improve this summer – yields us more than we like to eat (although with the risotto recipe I came up with might make me want to increase the take). Anyway, enjoy the highlight reel. Just watched a few of your clips ……awseome stuff…..only those of us who have put in the pain for a few hardy birds can know what Chukka huntin is all about . We have Chukka here in NZ..they live in the southern Alps of the South Island . Only a few hardened hunters put in the effort to target them . I hopefully heading down there in a few weeks time . I hunt Pheasant , Quail and Duck the rest of the season . Trout in the summer and deer in the fall ! Love you videos. My husband and I have a very similar situation when we hunt – he shoots and I video/take pictures. We own a Dutch Partridge Dog who is only 2 years old and are hoping to finally get him on wild birds this season. This is our first gun dog. We live near Seattle, but have friends in the Mountain Home area of Idaho, so we are planning on making some trips over this year. Any suggestions for what kinds of terrain to look for? We just want our boy on wild birds instead of just the pigeons we have been training with. 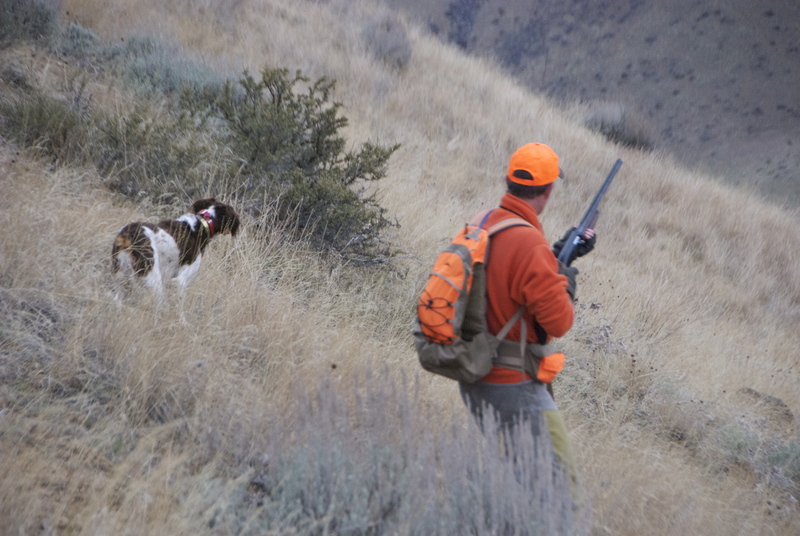 Not asking for your secret spots, just hoping to get some ideas on where to start for chukar and maybe grouse. We might also try out the WMAs….do you think those are worth the trip? Thanks for your comment. Glad to hear you’re heading to chukar country! My advice regarding your question on terrain would be to get O’Toole’s book and the kindle version (the only one available) of Echoes of Rimrock. My other advice would be to wait until it cools down in late September and October before you head to the hills. You and your dog will sweat a lot and it’s more fun when you’re not soaked and constantly needing water. There are some great areas near Mountain Home. Check out the “Tucker’s Chukars” blog; he lives in that area. Steep hills with cheatgrass, rocks, near water (springs, creeks, ponds, lakes, rivers) will have chukars. Have fun with your new adventure. Oh, one other tip: practice, practice, and practice shooting as much “unexpected” shots (both with the gun and your camera). You never know when or where the birds will come from or fly to. If your dog can point and hold them it will help, but even when they point you don’t know exactly where they are. Some of my videos demonstrate this pretty clearly. That’s one of the things that makes it so much fun! Cheers! Thanks Bob! We were planning to make our first trip Mid-Oct. That way we can head to the eastern part of the state and try our luck at Sharptails also. It’s a 10 hour drive, so gotta make the most of the trip. Really don’t wanna spend the entire trip sweating…in fact, I’d rather hunt in snow. I will spend some time today looking at that book and blog. Our dog is 2, so he’s still pretty new. We hunt pheasant in Washington, but they are a different bird as you know. He is usually steady, but wild birds are different and way more exciting. This season I will be happy if he finds birds at all. We are in this for him for than for us 🙂 Thanks again!